Several years I came online to look up information about my workplace harassment, only to discover that my workplace situation was something called workplace mobbing. After finding out about the workplace mobbing, I found out that my situation was something worst, it was really something called Gang Stalking. After staying on some of the support groups for some time, I realised that the groups were run by the other side, and I left. However one of the things that had been discussed was getting Gang Stalking normalized in society. How to get Gang Stalking normalized? The groups had talked about contacting helpful organizations, sending out pamphlets, etc. All the usual routes, but unlike mobbing, or bullying, most people did not want to discuss the topic. Remember this was the day of forum accounts getting banned, for starting a thread on the topic, legit threads being closed. So how do you get a topic normalized that is in essence taboo? One of the first things I did was to start to use resources, like the urban dictionary. See there are two ways that things can get done. The traditional way, go to organizations, hand out pamphlets, etc, or the other way. Start using it online, use it in the slang way, until the term get’s popular. If anyone has studied modern society, they realize, that things tend to work in a reverse pyramid type of way. They trickle down to up. The slang of today, are the normalized everyday words of tomorrow. So when the traditional route did not work, my strategy was the other. So four or five years later here we are. The term has made it’s way into our cultural dialect. The news stories in the paper use the term, and they use it correctly. The parodies that the community have had done in regards to Gang Stalking also use the term correctly. By going the less traditional route, the term has come a long way. Along the way the Indigo Ribbon campaign was added. A symbol that Targeted Individuals could use to identify and support our cause along the way. November is Indigo Ribbon month, so don’t forget to wear your Indigo Ribbon buttons. Along the way, I have had to personally fight to keep the term alive. There was a campaign to remove the term some years ago, a campaign which failed. A campaign which would have seen the movement start from scratch. In taking a stance, the Gang Stalking World website has been targeted by some, placed on their hit lists, or rather credibility lists, but it’s been worth it. Along the line, the vigilante myth has been explored many times, and outed. The vigilante myth that still keeps going even though the truth is out there. Recently I had the chance to do some more investigation on David Lawson, I found out some interesting details, but I won’t post most of it here, for now. But needless to say, it’s a network system, and the other side tends to control most of what the public believes or what information is disseminated, despite all the good information that is out there. 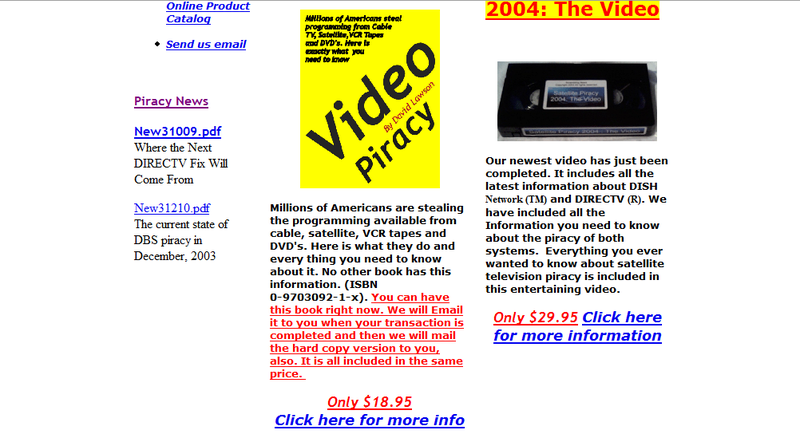 I am also not sure how many are familiar with Mr. Lawson’s first book on satalight piracy. It’s been pointed out several times, that the government back in the 90’s set up website to catch satalight thieves. Mr. Lawson just happened to have such a site, from whence that book and several others on the topic were sold, along with his terrorist stalking book ofcourse. The truth of this has been exposed time and time again by, but as long as the other side keeps selling the vigilante myth, that’s what the people keep swallowing. Feel free to search the blog, it’s been discussed many times. Remember there is one specific person who has helped keep this myth alive. While denouncing legit websites, this person who claims to have meet David Lawson, or spoken to him, continually supported, and touted his book, without ever requesting proof, that what he was saying was the truth. This same person however had a very different criteria for websites who pointed out government involvement. A different criteria that is for some websites that pointed out the government was involved, other sites saying the same thing, were oddly enough left alone. Either way, today some progress is being made. Years ago, the Lawson book is all we had, then the Naylor book. Today there are several books about this topic, and targets have a lot more variety and choice. As an individual who had to take on the role of activist, I am deeply happy with where things are today. I can look back and see the road that has been travelled, and the progress that has been made. Internally I am in a really good place, and am happier than I have been in a really long time. The scary thing about this system is that they want to paint targets as depressed, suicidal, unhappy. Many targets might not socialize the way they use to, or hang out the way they once did, but that does not make them happy. I can only speak for myself, but anytime spent away from the creatures that are involved in the destruction of innocent lives, is time well spent. I put a lot of effort into my activism, and it’s paid off. I am many things but unhappy is not one of them. Financially, sure my activism has not made me rich. The full time job that this has become is as mentioned before more of a volunteer position than anything else. Rich in spirit, and not in much else right now, but I am really happy, and in a good place. See as a target you see so much up and down, each new crew that they get interpret things the way they would act. I had a conversation recently about how unhappy I should be about neural monitoring, and the other person was expressing how depressed they would be, but I pointed out that I would view that as an opportunity. If someone was remotely neural monitoring me, I would use the opportunity 24/7 to let them know what I thought of them, and their system. For me I have learnt to not even let the thought of such faze me. I have learnt through this to have a really upbeat attitude most of the time. Sure there are the odd days that are worst than some, but I like who I am becoming on the inside. If nothing else this targeting builds character, and I have gained plenty in droves. If I didn’t have character before, I sure have plenty now, and I really like who I am. Finances, I think about them, but I don’t worry. The amazing thing is that overnight you can lose a fortune, but you can also become one of the wealthiest persons on the planet. Several years ago, J.K. Rowlings was literally on the dole in the U.K. she could not support herself, and then she started writing, today not only is she the author of one of the most popular book series ever written, but she is one of the wealthiest women in the U.K. So these informant tend to project a lot, oh the target must be depressed, yes if you were in my situation you would be depressed, but thank God, you are not me, and I do not think, function, or do anything like you. Stop projecting your ineptness on me. Unlike you, I have been there done that. These people have messed with my life so much over the years, I just don’t care. I have been tortured, fried, shaken, burnt, had their radar guns, laser guns, you name it used on me, over the years, and I am still standing. So really where most of them would have cracked by now, I am sure, I am not them, and each day that goes by, I am eternally grateful for that. So there are some improvements. Nothing in life is perfect, but I like where some things are going, and I look forward to activism in future, and yes writing the next Harry Potter type series would not hurt either, but hope does spring eternal and that is what counts. My sense of humour is well intact despite all this, and I do hope, even thought things at times do look dark at times, I do hope. You can also post it on blogs, forums, websites, etc. Each campaign is independently managed and operated and yet all effort go towards promoting awareness and understanding of Targeted Individuals and their plight. Volunteers can post on forums, send out emails, post in ezines, online news sites, blogs, podcasts, conference calls, youtube. 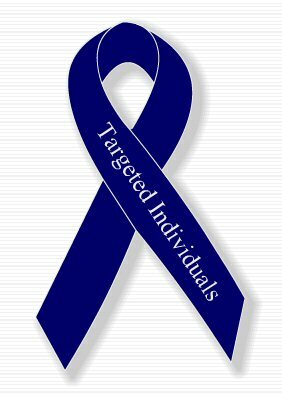 Who are Targeted Individuals? They are innocent individuals that are being targeted by government programs and initiatives, past and present. To find out more about the Indigo Ribbon Campaign, or what you can do to help, you can follow this link. http://www.Indigoribbon.com/Quilt. You can now purchase this the Hardcopy of this book at Amazon.com. This book is a great way to help you and others understand what Gang Stalking is, and why it could be happening in society. The book will answer a lot of the questions that get thrown out at targets. Why would the government do this? You are just not that interesting? Who would spend that much money to track and stalk you? How could so many people be taking part? You are just paranoid? Has this ever happened before? It really should help to bridge some of the gaps between the regular population and the targeted individuals community. Below are the chapters. Again the book is now available at Amazon.com and you can find it by using this link.